View and Edit member file. 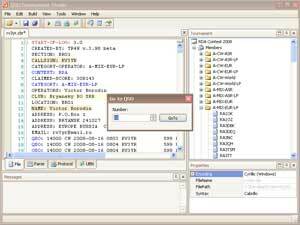 The program has the built in editor in which it is possible to open an initial member file for viewing, search of errors and modification. 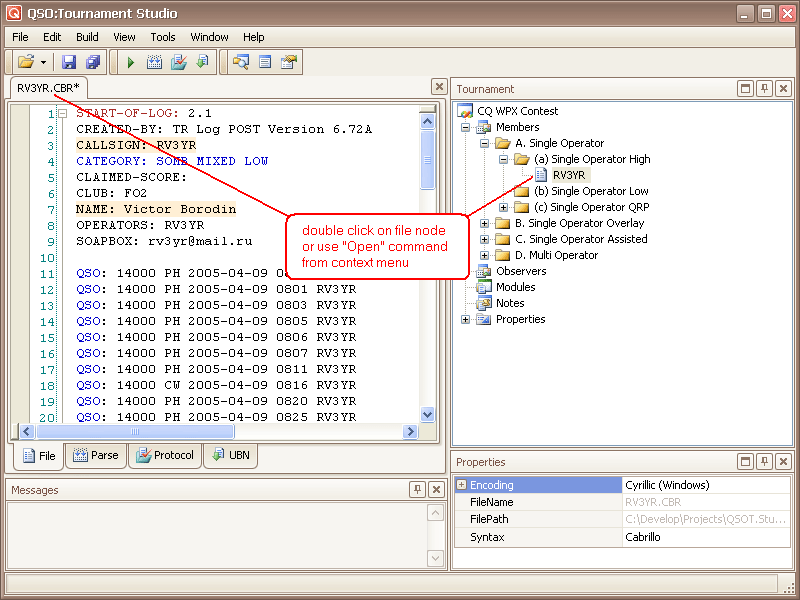 The editor can syntactic highlight of the text, display of special symbols (not visible in simple text editors). 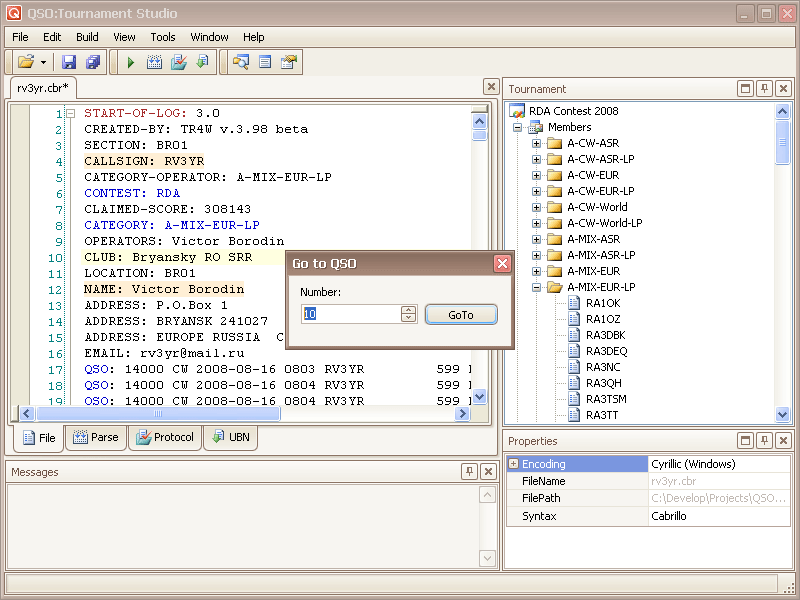 The editor allows to process correctly initial file in different encodings. Double click by the mouse on a file in a competition tree will open it on separate editor tab. Probably to open a file not being in competition - the menu "File" - "Open...". 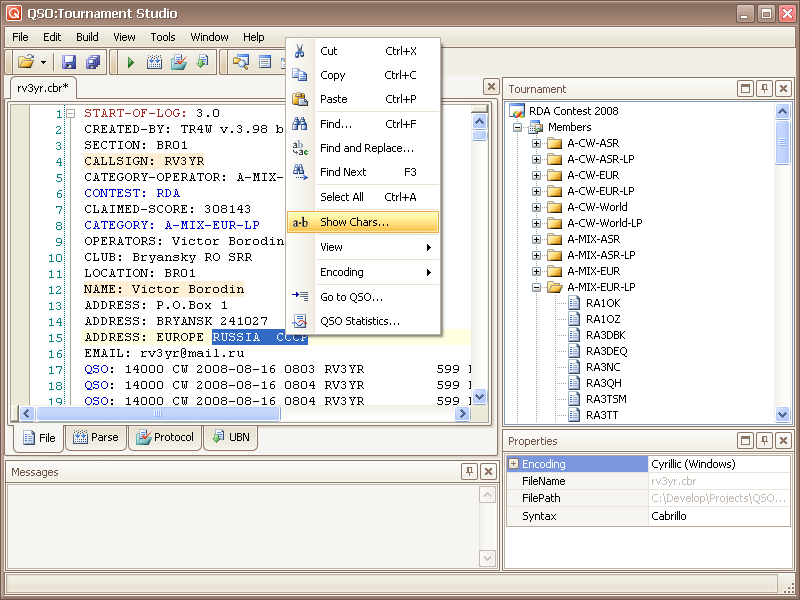 In the appeared dialogue to choose the necessary type of a file and to specify it in file system of the computer. The file editor has tabs. The initial file content is displayed on tab "File". All processing is made on the basis of contents of this tab. 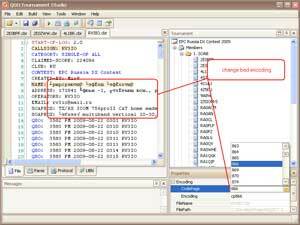 Tab "Parse" displays result of parsing of the file content from tab "File". It allows to be convinced of correctness of understanding by the module of tournament of structure of an initial file of the participant. Tab "Protocol" contains result of processing of a file content from tab "File" with the full analysis of an addition of points and errors. 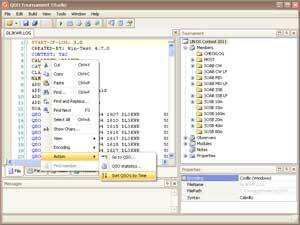 To keep the protocol in a file it is possible a command "Save" (Ctrl+S) the main menu or the panel of tools. Tab "UBN" contains result of processing of a file content from tab "File". Represents the ready text for an UBN-file. It is possible to keep it in a file a command "Save" (Ctrl+S) the main menu. Frequently initial files send in encoding distinct from used by default in an operating system (for example a file in the coding 866 (DOS) instead of Win1251). 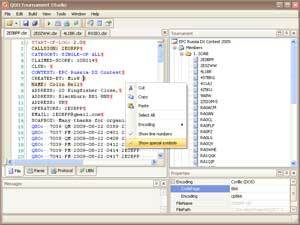 The program allows to specify the coding of the sent file manually. The initial file thus does not vary, competition remembers the coding approaching for processing of this file. 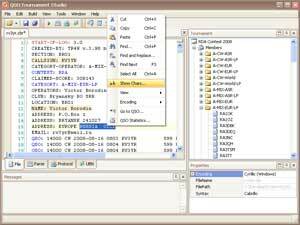 The program allows to shift time of all QSO-records of the chosen file for the specified quantity of minutes. The initial file thus does not vary. For example: "TimeShift=120" means the account of QSO-time at two hours later, and "TimeShift=-120" means two hours earlier. Click the right button of the mouse under the file text. There will be a context menu in which it is necessary to choose "Show special symbols". Display of not printed (special) symbols allows to find difficult found out errors in structure of initial files. 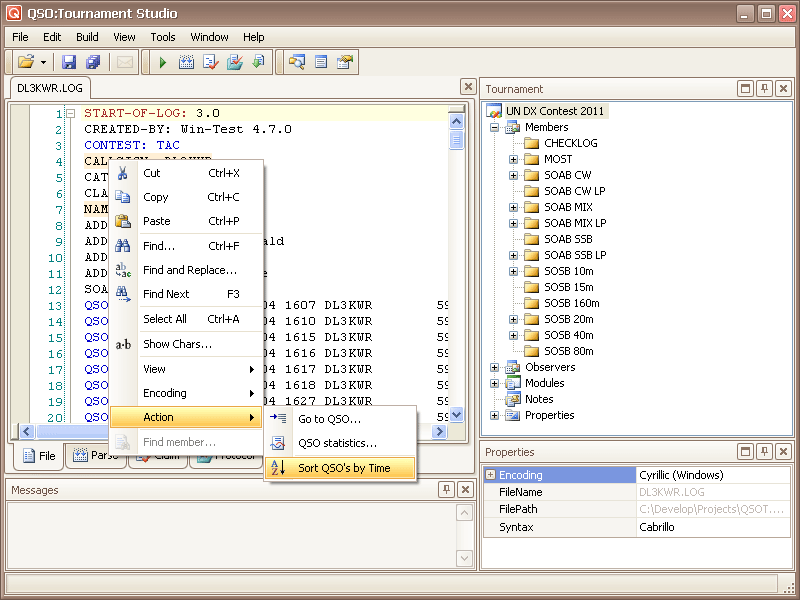 If you wish to save changes made to a file, take advantage of a command "Save" (Ctrl+S) the main menu or the tools panel. Display of symbols. "Show Chars..." action. Sometimes at the analysis of a contained file it is required to learn which chars are used (for example similar symbols on a writing of different localizations, or not printed (whitespace) symbols). Make selection of a contained file. Choose a command "Show Chars..." from the context menu (click the right button of the mouse under the text). 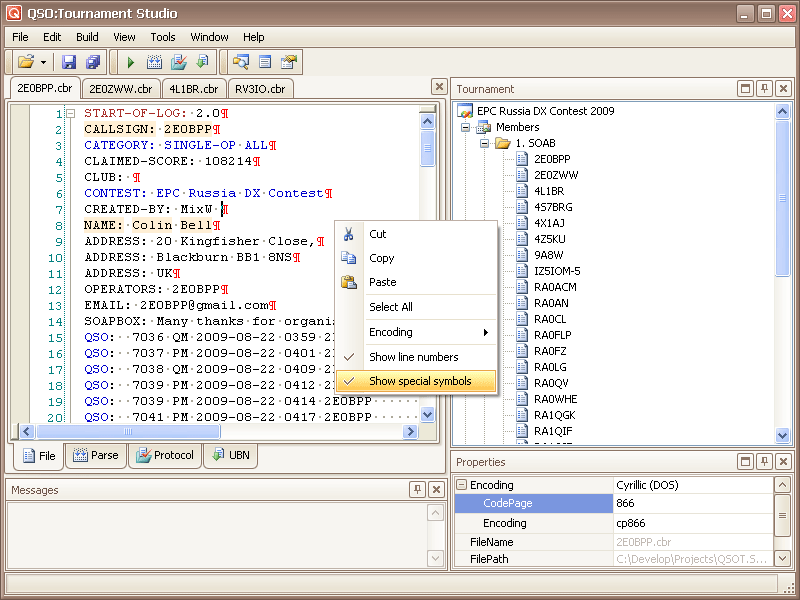 The selection of the text will be shown symbol-by-symbol with a code of each symbol. Symbols not a Latin set will be allocated by a sign "nonLat", not displayed symbols will be presented by the codes. Positioning to QSO-record by number. For a file included in tournament, positioning to QSO-record with specified number is possible. 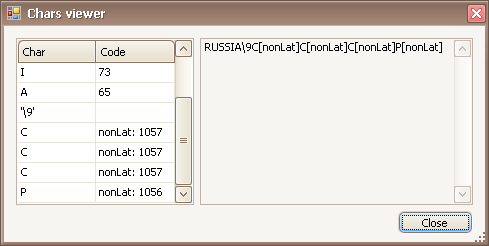 Choose a command "Go to QSO..." from the context menu (click the right button of the mouse under the text). Enter the number of QSO-record and click button "GoTo". 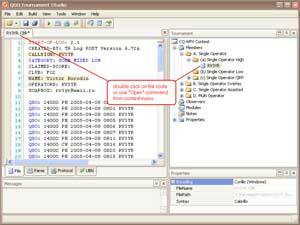 The cursor in the file text will be moved by the line with specified number of QSO-record. 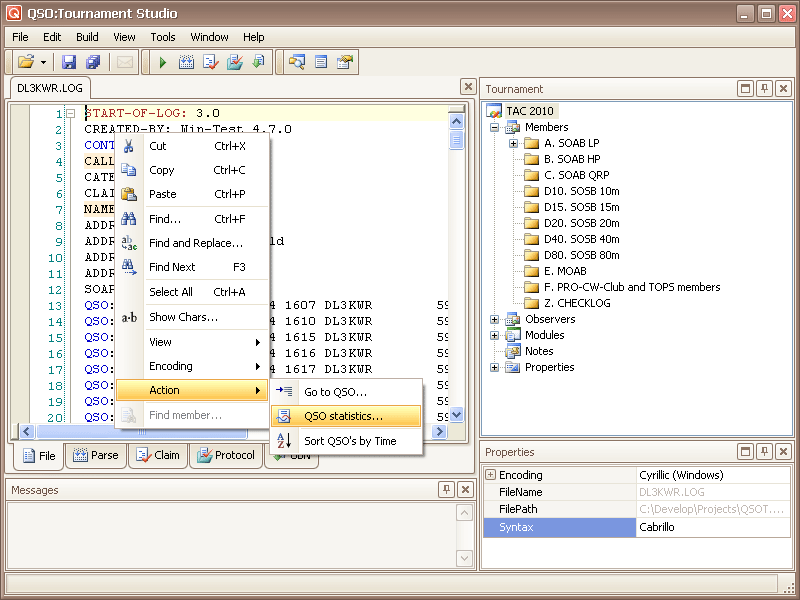 For a file included in tournament, calculation of quantity of QSO-records from the point of view of bands and modes is possible. 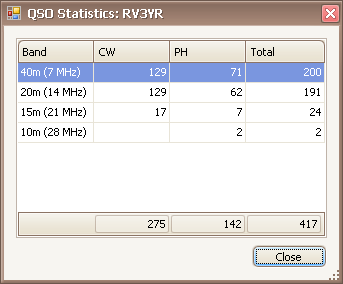 Choose a command "QSO statistics..." from the context menu (click the right button of the mouse under the text). 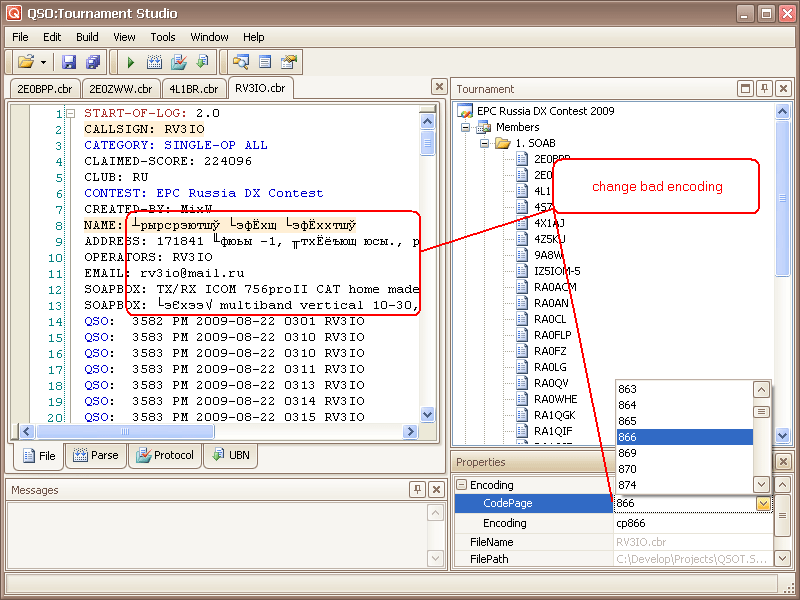 Sometimes it is required to sort QSO-records in an initial file. Use a command "Sort QSO by Time" in the context menu.